Tomorrow I’ll be reviewing three books that feature Year 7 girls as protagonists. One of them is Perfectly Ella by Candy Harper, a new witty and enjoyable coming-of-age tale about Ella, who is the fourth of five sisters. Ella has to deal with family break-up, shifting friendships, and being part of a large family of girls. Author Candy Harper is herself the fourth of five sisters, so I wanted to quiz her on her fabulous family. MinervaReads: I’ve always fancied myself as a bit of a Jo from Little Women, or Saffy from the Casson series of books. Who are your favourite fictional sisters? Are any of your siblings also writers – like an Emily to your Charlotte Bronte? CH: No, but my 10 year-old daughter, Lyra, is a brilliant writer and illustrator. Her latest picture book ‘The Day All the Pets at the Pet Show Died’ is a heart-breaking work of staggering genius and I’m sure we’ll see it in bookshops soon. Many groups of siblings have formed some kind of group act – Jackson Five, The Von Trapp singers, etc. Does your family have a special talent? CH: We can’t sing, dance or play the ukulele, but we do know how to put on a rollicking good row. During which, two sisters are usually blisteringly angry, and the other three are convulsed with laughter. Seeing my littlest sister (who is actually quite tall) grab my middle sister (who is Kylie Minogue sized) by her collar and pin her up against a wall is a special memory I will treasure forever. You have four sisters. Did you miss not having a brother? CH: When my mum was pregnant with my little sister I really hoped she’d be a brother. When she was born, my parents bought me a boy doll to make me feel better. For the next three years I spoke to the doll more than I did my little sister. Then I discovered she was small enough to sneak under our back fence into the neighbour’s raspberry patch, and all was forgiven. Ever since then, as long as people bring me something nice, I don’t mind which gender they are or whose garden they’ve stolen it from. What is the best and worst thing about having four sisters? CH: Growing up, the worst thing was that they were EVERYWHERE. We were a family of seven living in a three bedroom semi. I used to climb into the airing cupboard to get some peace and quiet. But on the plus side, there was always someone to play with. You are the fourth of five sisters. Did you ever get bought anything new? CH: Ha! You sound like a younger sibling yourself. The short answer is no. 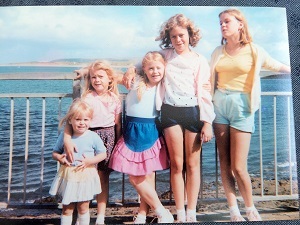 I was always optimistic about the whole hand-me-down process; I used to admire the new things my big sisters got and imagine how great I’d look in them years later, ignoring the fact that they’d be covered in felt tip stains and bobbles by then. It took me a while to consider the impact of changing fashions, too. I remember looking at my eldest sister’s mint green court shoes and thinking ‘One day those babies will be mine.’ When they finally reached me in the ’90s, everyone was wearing Doc Martins and I was a lot less keen on them. With huge thanks to Candy Harper for being so honest and sharing her stories of sibling rivalry with me. Look out for my review of Perfectly Ella here. To win one of five giveaway copies of Perfectly Ella, find me on twitter @minervamoan and follow and retweet. If you’re not lucky enough to win, you can buy your own copy in the shops here.